In The Odyssey, the goddess Dawn is invariably called “rosy-fingered Dawn,” and as such, she tends to bring good things: brightness, blooms, birth, sky-touching. The rosy warmth of our Daybreak Scarf embraces the same optimism, bringing with it substance, depth, and a heady outlook on a new day. 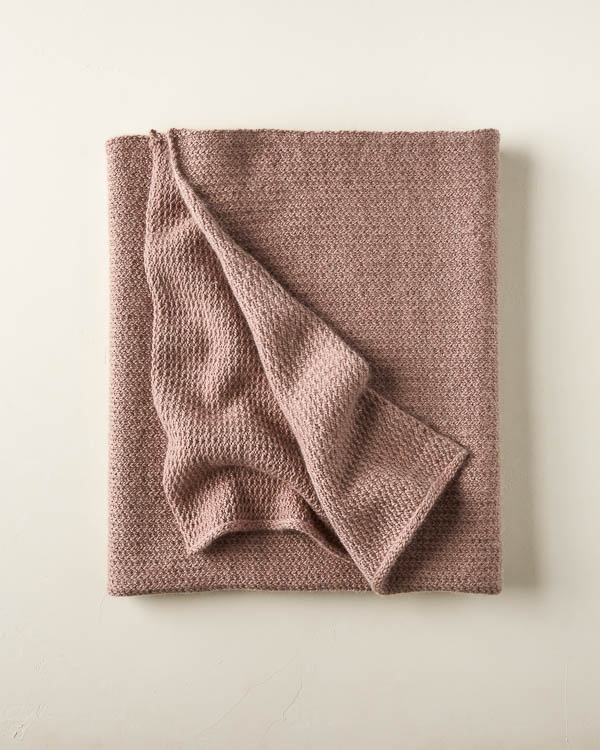 Our Daybreak Scarf, knit up in Rose Granite Cashmere Merino Bloom, is a super soft layer for any kind of odyssey: over mythological seas or through early-morning subway commutes. We suspect it will become a new classic for chilly days both close to home and on epic adventures. The stitch, the same one traditionally used for sock heels of socks, makes for an exceptionally cushiony, lofty, cozy scarf. Designed for Purl Soho by Joelle Hoverson. 6 skeins of Purl Soho’s Cashmere Merino Bloom, 75% extra fine merino wool and 25% cashmere. We used the color Rose Granite. You can cast on any odd number for this pattern. This scarf will tend to roll in on itself a bit. That’s why we made it extra wide, and we think it’s super cozy and beautiful how it curves into your neck! Row 1 (right side): K1, *slip 1 purlwise with yarn in back, k1, repeat from * to end of row. Row 2 (wrong side): Slip 1 purlwise with yarn in front, purl to last stitch, slip 1 wyif. Repeat Rows 1 and 2 until piece measures 82 inches from cast-on edge, ending with Row 2. Bind Off (right side): Loosely bind off in stitch pattern. Weave in the ends and block. This looks gorgeous – thanks for sharing it. If I did a 4 stitch I-cord, at both ends of the rows, as I knit, would this stop the edges curling? If so, I suppose I’d leave ROW 1 as it is, but what would I do for ROW 2? should I leave out the 1st and last slip stitches? I’d be most grateful to know what you think. Thanks for writing in! 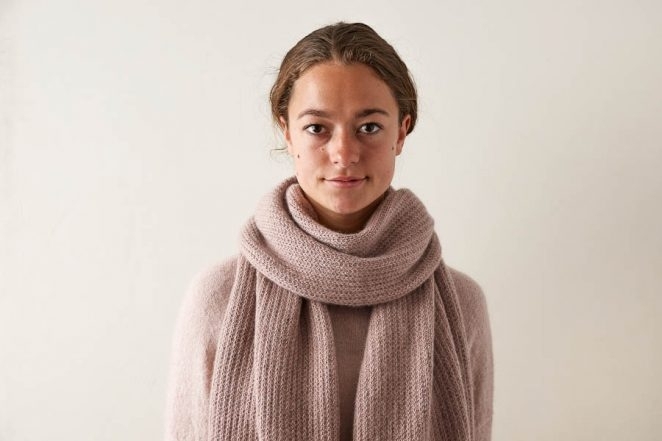 Although an I-cord edging would certainly help and would look quite attractive, you will still need to wet block the scarf for it to lay truly flat. To add this edging, I would add 8 stitches to the cast on number, and on every right side row, slip the first four stitches with the yarn in back, work the row as written to the last 4 stitches, and slip these four stitches with the yarn in back as well. On the wrong side rows, you will simply purl the first four and last four stitches and work the row as written in between. What changes should be made to make this into a cowl or Mobius instead of a scarf? Thanks for reaching out! Great question! 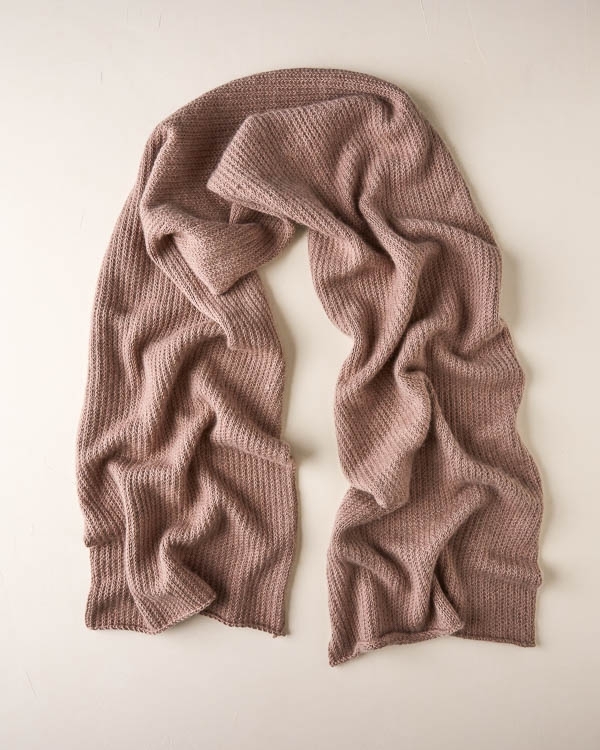 The easiest way would be to knit the scarf to the length that you would like and then sew the two ends together. You could also do a provisional cast on to start with and then kitchener the two ends together. Alternately, you could cast on an odd number of stitches and round 1 would be the same as row 1 and round 2 would be all knits. You would then repeat rounds 1 and 2 until you got to the height that you would like! I’d like to turn this into an infinity scarf that would measure 60-72” long. Would I follow your instructions above, regarding casting on an odd number of stitches and, if so, what number would you suggest I cast on? Thanks for reaching out! The easiest way to do this will be to just follow the directions and knit till it is your desired length. If you do this than you will cast on 101 stitches and your infinity scarf will be 15″ wide. I hope this makes sense and let us know if you have any further questions! Thank you for keeping me on your mailing list. I just loved your store and whenever I get to New York City, I make a bee line to see all of you. We live in the Pacific North West so it is a long trip to see you, but it continues to be one of my favorite places to visit. Thank you for visiting us and for your kind words! While shopping with you all in June, I bought several yarns and one was your Peony Pink, Mulberry Merino Heather (80% extra fine merino wool and 20% mulberry silk, 247 yards, 4 to 6 needle-5skeins. It’s lovely!! Could I substitute this yarn for the Cashmere Merino blend featured? And, would it be as soft? Thank you in advance. Thanks for reaching out and for your kind words! Mulberry Merino would be lovely for this scarf! You may be able to use the same needles but I would certainly suggesting swatching first to see if you like the fabric as you may want to go down a needle size if your are a fairly even gauge knitter. However, if you like the fabric on the needles that we used here, you will be all set to go! 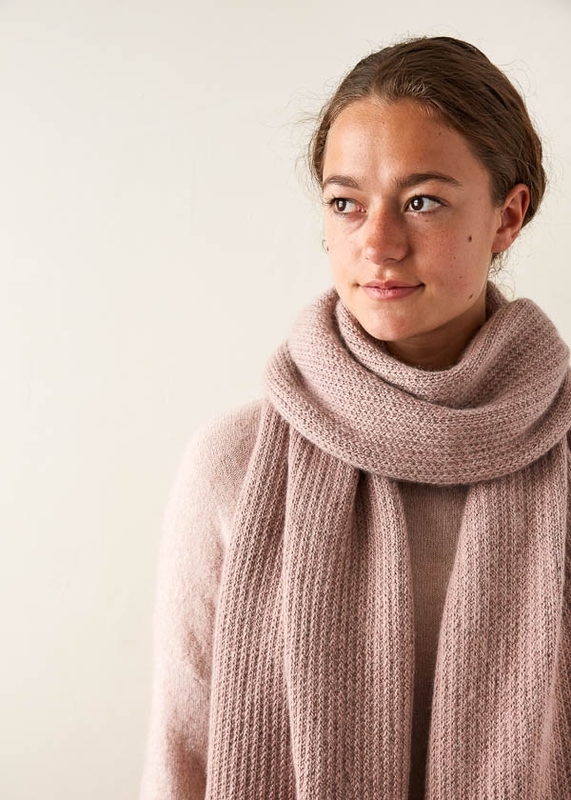 You will have a little less yardage with the 5 skeins of Mulberry Merino that you have and as such, you may want to make your scarf a touch narrower so that you can get the whole length. I think that a cast on of 91 stitches would get you there! Cassy, thank you so much for your response. See you all again the next time I’m back in NYC!! You’re always a joy to shop with. 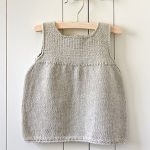 Hi, I love this lovely pattern, and it’s easy to knit. I have an issue with the starting rows, which start to curl up. To prevent the bottom end from curling, can I knit the first four or five rows in garter stitch? Would you recommend this? 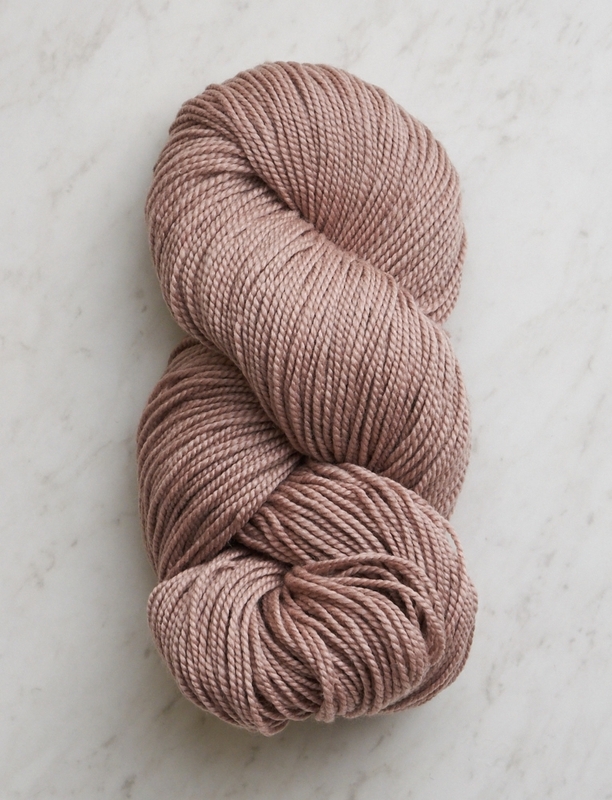 I would like to know before I buy the Cashmere Merino Bloom yarn, which is quite costly. Thanks for reaching out! This scarf will tend to roll in on itself a bit. That’s why we made it extra wide, and we think it’s super cozy and beautiful how it curves into your neck! The extra width along with the yarn helps to keep it from rolling so much. You could also add a garter border if you like or add an i-cord border once you are done if it still seems to be rolling too much for you! Row 2 states purl to the LAST stitch. Then it states slip a stitch wyif. If one stitches to the last stitch on row 2 , there wouldn’t be another stitch left to slip. I find this confusing. Thank you for reaching out! For row 2 you are purling every stitch except the first and last stitches of your row which you are slipping. This looks pretty and easy. But ever since menopause, I’ve had problems with wooly stuff (even alpaca) being itchy on my neck. 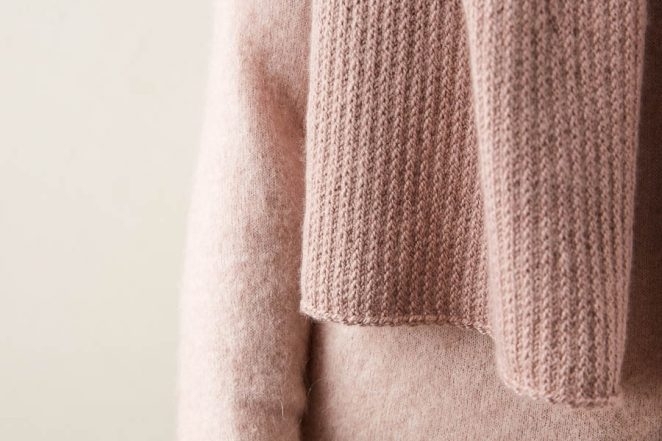 This question might make wool lovers groan but is it possible to knit it in cotton, linen or silk? Thank you for reaching out! Unfortunately most of our cotton, silk and linen are to small of a gauge to work for this pattern. I’m not sure you level of sensitivity is, everyone is different, but my first recommendation would be Understory. This yarn is 50% Alpaca 25% Silk and 25% Baby Yak. Another option would be to use Jade Sapphire’s 6 ply Cashmere. I would also check out or Flute Wrap which has a similar look and is knit with our Field Linen which is 100% Linen. What a beautiful scarf and the yarn sounds lovely. I have a question about the instructions-the description before the pattern states, “It’s an easy two-row repeat, where both rows are just knit one, slip one.” But that is not what the instructions say, “Row 1 (right side): K1, *slip 1 purlwise with yarn in back, k1, repeat from * to end of row. Other than 2 slipped stitches, the second row is purl in the instructions. Are the instructions correct? Thanks for reaching out, and I apologize that the description was not clear! The pattern as written, with each wrong side row worked as a row of plain purls, is correct and will result in the stitch pattern as shown in the pictures. Thanks for writing in! 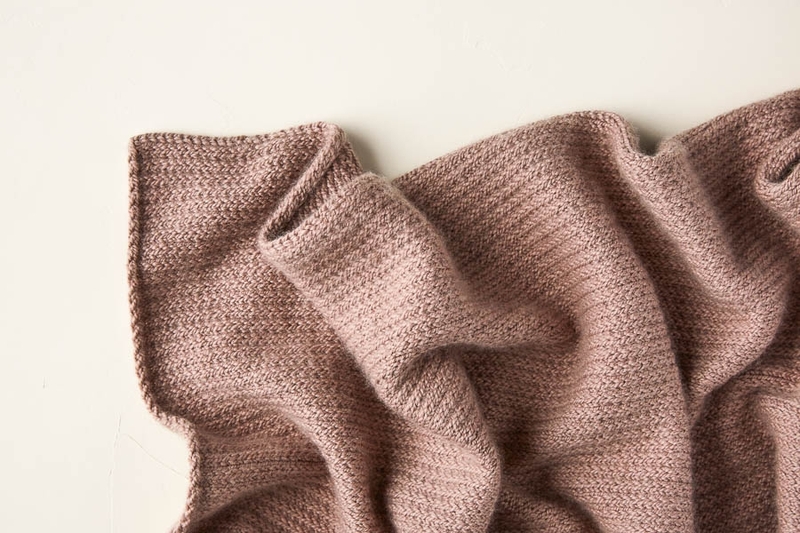 Fortunately, Understory and Cashmere Merino Bloom knit to almost the same gauge, so you will not need to make any changes to the pattern or needle size! You will need 6 skeins of Understory. I want to make this with some color changes. When/where is the best time/place to add the next color? I’m about 6 rows in and I just love it so far! Thank you so much for the kind words, and what a great idea! 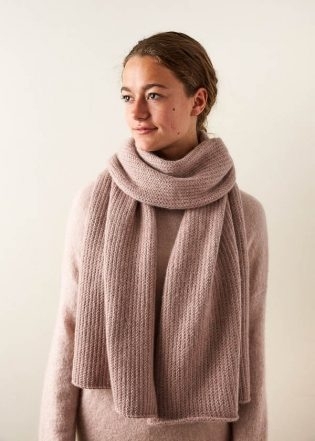 Although you can begin or add stripes or color blocks wherever you wish, I would just make sure that you always change colors on a right side row so that your color changes all look the same and any untidy color changes end up on the wrong side of the scarf. Best of luck, and please do let us know how it turns out! Hi! I love this pattern and wanted to know what the stitch name is called? Would this stitch be good for a blanket? 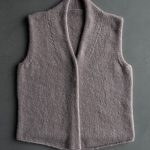 I have a super soft sport weight merino wool and I’m looking for a pattern that will give it a little more thickness than if I just did a stitch like stockinette. I have 4,000 yards of it so I’m limited on what patterns I can do. Right now I’m torn between your double seed stitch blanket pattern (which I’ve knitted in the past) and this stitch for the scarf. I calculated that with DK/light worsted yarn I would need around 3,000 yards to make this a 48×60 inch blanket. 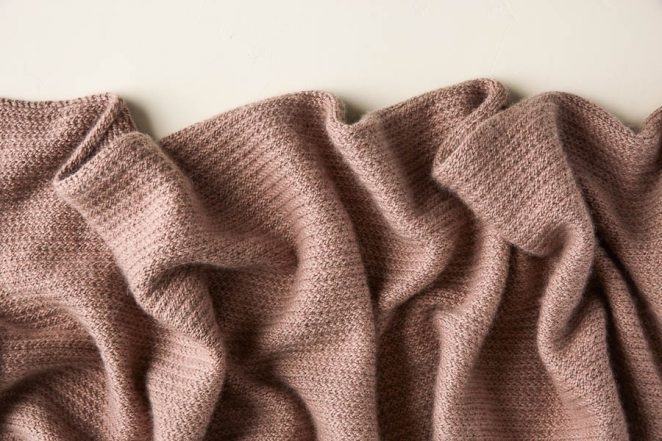 Do you believe 4,000 yards of sport weight would be enough for that size blanket in this pattern? I get about 6-7 stitches to the inch on size 3.5 needles in stockinette stitch. Thank you so much for your help. I spent a fortune (for me) on this yarn and I want to make a good decision about what pattern to use. Thanks for reaching out! Although I don’t know of a name for this exact stitch, it is a variation of a slip stitch pattern and it does create quite a thick, squishy fabric which might be what you are looking for. 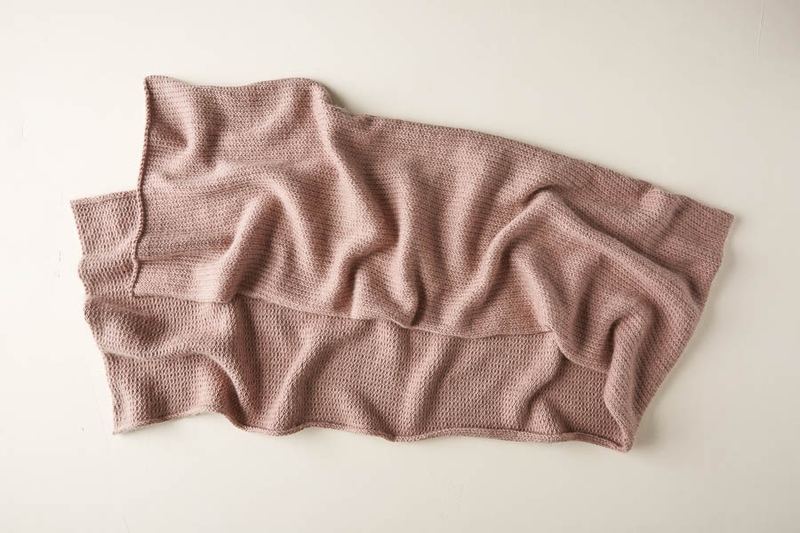 The only downsides to using it for a blanket are that it does have a definite right and wrong side, and it tends to curl a bit on the edges, as you can see in our pictures, though neither of these things would make it a bad blanket! It’s just something to keep in mind when you are selecting the stitch. 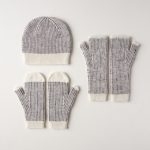 Since slip stitch patterns come out quite a bit narrower than stockinette, I would suggest knitting a swatch in pattern to figure out your stitches per inch. I also came up with around 3,000 yards for a blanket in the original DK weight yarn, so I think you should have plenty of yardage! I hope that helps and that you end up with a lovely blanket!